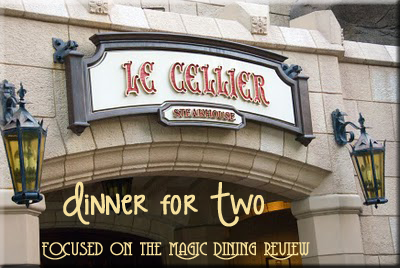 Le Cellier Steakhouse the most coveted Advanced Dining reservation (ADR) in Epcot's World Showcase and we were about to have our much anticipated dinner. 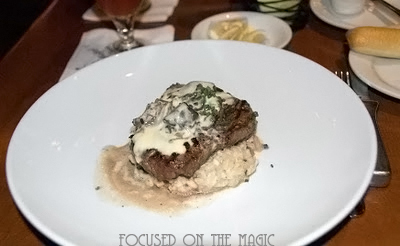 I've dined at Le Cellier four times over the years. On our last visit we arrived early for our 7:30pm ADR. Signed in at the podium and was handed a pager. Before settling down to wait we were whisked to our table. It's the strangest thing I always get the same table. Sure enough there we were being shown to that "terrible twos" table again in the Province of Quebec section. Our server welcomed us to Le Cellier, offered menus and gave us a little background into her home country of Canada. We had purchased the Disney Dining Plan for the week which would allow for one table service meal, one counter service per day and one snack per day. Drink orders were taken. Pomegranate Lemonade with a splash of real ice tea and lemon on the side. 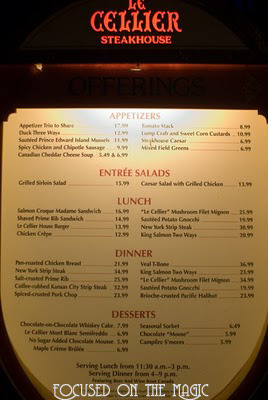 Looking over the menu I chose the coveted "Le Cellier" Mushroom Fillet Mignon. Fillet Mignon with mushrooms and white truffles cooked to perfection. 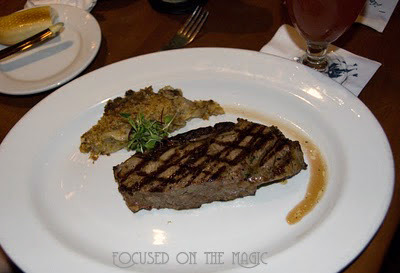 Peter had the NY strip steak. It was all very good and very filling. I wish they'd added a little vegetable and cut back on the salt but we both ate every last morsel. Then it was time for dessert. We ordered the Chocolate "Moose" and the Passion Fruit Sorbet. I ordered the sorbet thinking that they might bring a cupcake or something with a candle and the sorbet and cake would be great. 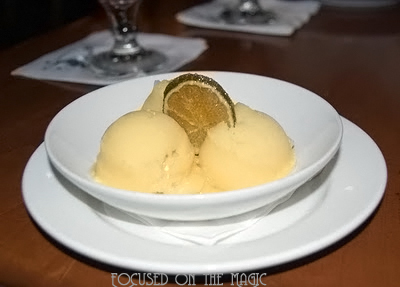 The passion fruit sorbet was topped with a sugar glazed lemon. A great ending to a memorable meal. 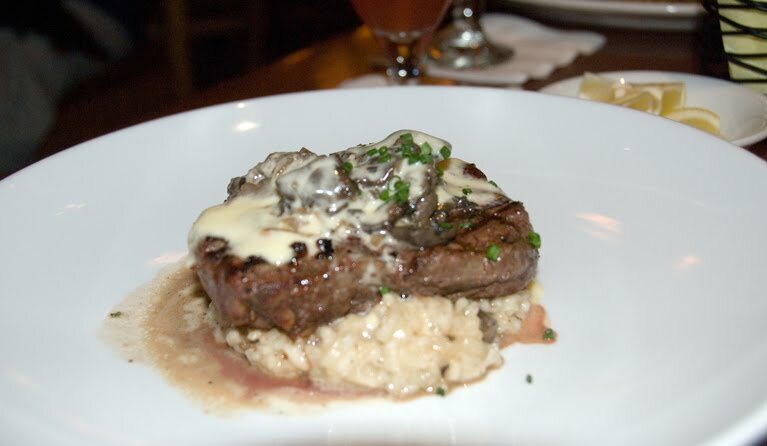 Do you have a favorite dish at Le Cellier?